The FFMA has long served the fraternal agents by offering excellent training through the FIC and FICF curriculum. We also recognize the serious need for training and support of our managers in the field. FFMA, along with Kinder Brothers International has developed this customized course specifically for fraternal mangers. This course will qualify each manager for the designation of Certified Fraternal Field Manager (CFFM) when completed. This course is also recognized by The American College for credit toward the Chartered Leadership Fellow (CLF) designation. The course includes modules on selection, training, recruiting, supervision, monitoring, and fraternal advantages in marketing. 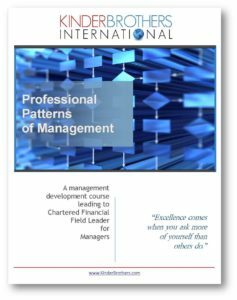 The Professional Patterns of Management is subsidized by the Fraternal Field Managers Association, allowing any company that is a member of the FFMA to receive the program at a substantial discount. This discount is about 75% of the cost that would be charged to a commercial company. Our goal is to make this relevant to the challenges our managers face today, and to make the course very affordable for each manager. Thank you for your support of the fraternal system.